Plan of study to define hydrogeologic characteristics of the Madera Limestone in the east mountain area of central New Mexico; 1999; OFR; 99-201; Rankin, D. R.
The east mountain area of central New Mexico includes the eastern one-third of Bernalillo County and portions of Sandoval, Santa Fe, and Torrance Counties. The area covers about 320 square miles. The Madera Limestone, the principal aquifer in the east mountain area, is the sole source of water for domestic, municipal, industrial, and agricultural uses for many residents. Some water is imported from wells near Edgewood by the Entranosa Water Cooperative, which serves a population of approximately 3,300. The remaining population is served by small water systems that derive supplies locally or by individually owned domestic wells. The population of the east mountain area has increased dramatically over the past 20 years. In 1970, the population of the east mountain area was about 4,000. Demographic projections suggest that approximately 1,000 people per year are moving into the area, and with a growth rate of 3.0 percent the population will be 16,700 in 2000. Consequently, ground-water withdrawals have increased substantially over the past 20 years, and will continue to increase. Little is known about the flow characteristics and hydrogeologic properties of the Madera Limestone. 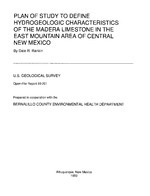 This report describes existing information about the geologic and hydrologic framework and flow characteristics of the Madera Limestone, and presents a plan of study for data-collection activities and interpretive studies that could be conducted to better define the hydrogeologic characteristics of the Madera Limestone. Data-collection activities and interpretive studies related to the hydrogeologic components of the Madera Limestone are prioritized. Activities that are necessary to improve the quantification of a component are prioritized as essential. Activities that could add additional understanding of a component, but would not be necessary to improve the quantification of a component, are prioritized as useful.